Sorry. 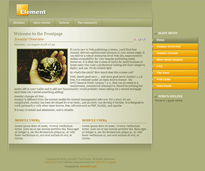 I can't take it back now, so it's done, but the new theme from Joomla 51 is called Element and it sort of just started to happen as I was typing the title. It has nothing to do with Sherlock Holmes though or medicine or detective work, it's just a simple clean theme with 'earthy colours'. It also comes with eight module positions, a valid, two column tableless design and a moomenu. To see a demo or for more information click here.